Published in Journal of Economic Geography 2014, volume 14, pages 313-337. This paper analyzes factors shaping technological capabilities in United States and European countries between 1998 and 2008. While much previous work and policy discussions compare individual European countries with the US as whole, this paper changes the unit of observation from the entire US economy to individual states, which arguably are more comparable to European countries. The results indicate that social capabilities, such as well-developed public knowledge infrastructure, an egalitarian distribution of income, a participatory democracy and prevalence of public safety, impact the degree to which European countries and US states succeed in developing technological capabilities. It is argued that policy makers who do not take these lessons into account may fail to reach the desired results of the policies they pursue. 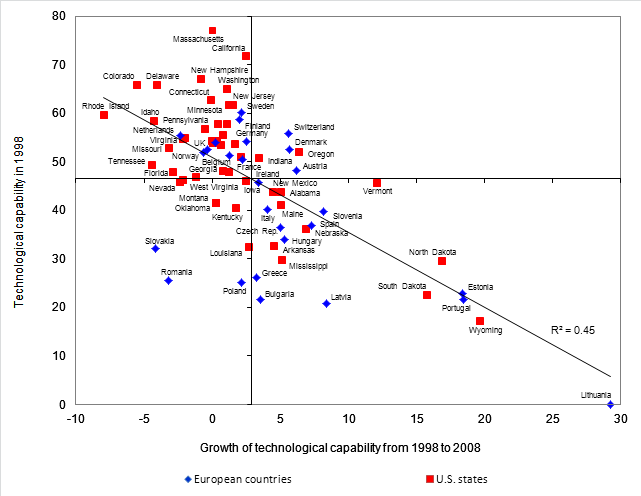 As for technological capability the analysis shows that most European countries are just as capable as US states. In fact, the major difference between the two continents is not so much related to their top performers as to the fact that Europe includes a number of formerly Socialist countries in Eastern Europe, which understandably have not yet managed to generate technological capabilities comparable to those of Western Europe. As for social capabilities, the biggest difference between US states and European countries appears to be in the development of norms, values, and institutions that facilitate economic activities, for which US states tend to lag considerably behind Europe. It has been common among policy makers, media and scholars to assume that the difference in performance across the US and Europe reflects fundamental differences in how the two economies work. The research presented here does not support this perspective, but rather suggests—at least as far as technological dynamics is concerned—that the underlying factors that influence dynamics among European countries as well as US states tend to be the same.